I wrote a fun, little story the other day about a pasty being shipped to California Gov. 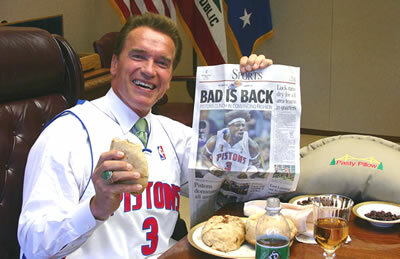 Arnold Schwarzenegger to fulfill a little bet between him and Michigan Gov. Jennifer Granholm. The above photo shows Schwarzenegger fulfilling the bet, but you can read my original story here. Smoke from the burning Gundlach Champion building casts a shadow over the Houghton waterfront on April 24. The smoke, visible from miles away, drew many on-lookers to the Portage Lake Shipping Canal to see firefighters battle the fire. Firefighters atop the City of Houghton Volunteer Fire Department’s ladder truck spray a jet of water into the flames that engulfed the Gundlach Champion building on the Houghton waterfront April 24. Four departments worked for nine hours to extinguish the blaze, which gutted the 100-year-old building. My long-planned update for this Web site is moving forward. I have a tentative design in place, and I’m starting to work on graphics. In the meantime, I wanted to put these photos up because I’m happy with my effort and the photos received some praise when they published. On the morning of April 24, I was heading in to WMTU to do my morning radio show. As I moved across the bridge, I realized that I wasn’t going to get to my show on time. What looked like an early dawn cloud from a distance was actually the Herman Gundlach building ablaze. I called the radio station to let them know I was going to be late because of work. I hit the Gazette (which was a block from the fire). As I’m about to leave work for the fire, my co-worker Garrett Nesse pops up. We decided to divide the labor — Garrett would write the story and I would shoot photos until a photographer could be contacted. Given that I only had to shoot photos, I had time to work on shooting and getting the best photos. For the first time, I used up an entire card of memory for a story (about 64 photos). I really worked to capture the scene up close. I moved across the bridge to the Quincy smelter site because I wanted to capture the fire from a different angle. I wasn’t certain that these photos would be used because typically the newspaper is focused on the action. Ultimately the long shot of the fire casting a smoky cloud over the area was the shot that was used out of the hundreds of photos that were submitted.